On 14th of June 2018 the Fifa World cup starts in Russia. We are looking forward to an exciting Tournament. Can Germany defend the title? Be a part of it. Watch the games live in Russia. Our Call a Jet team take care about everything. We pick you up at home drive you to the airport where your Jet and Crew is waiting. Our team member Yuliya Kurta is from St. Petersburg and can speak fluent russian. She will help with Visa, Hotels, match tickets and so on. Just relax and enjoy the tournament together with friends or family. 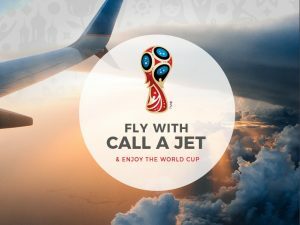 Book your World Cup package now.